As I was once again wandering through Trader Joe’s yesterday I remembered that I had a box of chicken stock sitting in my fridge. What to do with it… For some reason the first thing that popped into my mind was chicken piccata, which is really what this recipe post is. Honestly I’m just not a fan of fancy/traditional names for dishes. I feel like proper names can be off putting. Chicken piccata? Eff you. 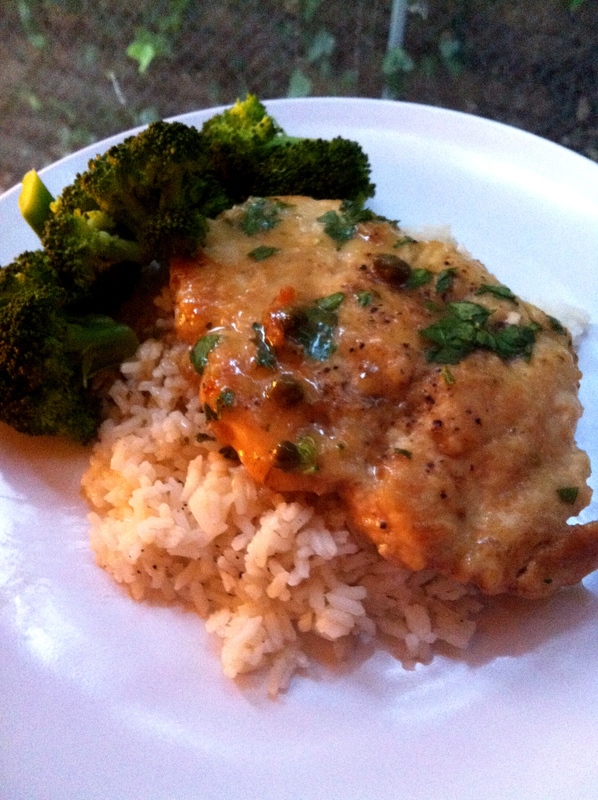 Melt-in-your-mouth lemon chicken? Sign me up. And come on, this dish really is just chicken breast cooked in a lemon sauce until it’s fall-apart-moist. What could be wrong with that? This is actually one of the only times I use boneless skinless chicken breast. Yeah they’re supposedly “healthy”, but they’re also flavorless and all-too-easy to overcook, not to mention WAY overpriced. I always go for the fattier and more flavorful (and way cheaper) thighs. But this is a recipe that allows the liquids to absorb into the chicken, which is exactly what a well-cooked chicken breast needs. The sauce is super lemony, but not in an obnoxious way. Cooking the chicken with a thin layer of flour leaves you with a thick, rich sauce that you can drizzle over rice. I even tossed the sauce with the broccoli you see in the picture. Perfect. And in terms of budget, I already had the stock, butter, capers, and parsley. All I purchased was a pack of chicken breasts for $5.50 (a bargain – I really had to look) and two lemons for like 40 cents. Streamlining classic dishes, keeping it classy and budget friendly – that’s how the starving artist rolls.